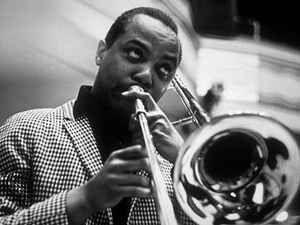 J.J. Johnson (born January 22, 1924, Indianapolis, Indiana, USA - died February 4, 2001, Indianapolis, Indiana) was an American jazz trombonist, composer and arranger. 1941-1942: he toured with the territory bands of Clarence Love and Snookum Russell. 1942-1945: Benny Carter's big band. Made his recording debut (taking a solo on "Love for Sale" in 1943) and played at the first Jazz at the Philharmonic (JATP) concert (1944). 1946-1960: various work with all of the top bop musicians, including Charlie Parker (with whom he recorded in 1947), the Dizzy Gillespie big band, Illinois Jacquet (1947-49) and the Miles Davis 'Birth of the Cool' Nonet. His own recordings from the era included work with Bud Powell and a young Sonny Rollins. He also recorded with the Metronome All Stars. 1951-1952: played with Oscar Pettiford and Miles Davis. 1954-1956: formed a two-trombone quintet with Kai Winding that became known as Jay & Kai - various reunions would later happen. 1956-1960: led a quintet that often included Bobby Jaspar; began to focus more on his own compositions, starting with 1956's "Poem for Brass" and including "El Camino Real" and a feature for Dizzy Gillespie, "Perceptions"; his "Lament" became a standard. 1961-1962: worked again with Miles Davis, and led some small groups of his own. 1960's: greater part of time spent writing television and film scores. By the 1970's, Johnson was so famous in the jazz world that he kept on winning Down Beat polls despite the fact that he was not really actively touring or playing. However, starting with a Japanese tour in 1977, J.J. gradually returned to a busy performance schedule; during the 1980's he would go on to lead a quintet that often featured Ralph Moore (2). Babs Gonzales And His Orchestra, Benny Golson Sextet, Cannonball Adderley All Stars, Charles Mingus Jazz Workshop, Chubby Jackson's Orchestra, Coleman Hawkins All Star Band, Coleman Hawkins And His Orchestra, Coleman Hawkins Septet, Count Basie Orchestra, Esquire All American Award Winners, Howard McGhee All Stars, Illinois Jacquet And His Orchestra, J.J. Johnson & His Orchestra, J.J. Johnson All Stars, J.J. Johnson And His Big Band, J.J. Johnson Quartet, J.J. Johnson's Bop Quintette, J.J. Johnson's Boppers, Kenny Dorham Octet, Metronome All Stars, Miles Davis All Stars, Newport Parker Tribute All Stars, Pete Rugolo Orchestra, Quincy Jones' All Star Big Band, Ray Ellis And His Orchestra, Stan Getz Septet, Tadd Dameron And His Orchestra, The Birdlanders, The Charlie Parker Sextet, The Four Trombones, The J.J. Johnson And Kai Winding Trombone Octet, The J.J. Johnson Quintet, The J.J. Johnson Sextet, The Jay And Kai Quintet, The Jazz All-Stars, The Miles Davis Nonet, The Miles Davis Sextet, The Modern Jazz Ensemble, The Modern Jazz Society, Urbie Green And Twenty Of The "World's Greatest"